All the gold jewellery made by Treasures of St Andrews is Hallmarked at the Edinburgh Assay Office for your protection. The ( TJ ) makers mark for Treasures Jewellery is a registered trademark and only stamped on our gold jewellery. 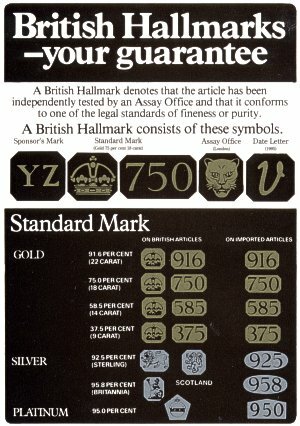 Hallmarking is a UK government requirement. There were Goldsmiths in many towns in the Middle Ages but only in Edinburgh were there enough to form, (about 1525), their own Trade Guild. They regulated their own affairs, prices, etc. and were also entrusted with protecting their customers from fraud; in particular they had to ensure that their members did not add more base metal to gold and silver (to harden them) than was allowed by an Act of Parliament of 1487. Objects were initially tested by their leader (Deacon), and by 1681 the First Assay Master was appointed to take over these duties. This same year the practice of applying a letter of the alphabet as part of the hallmark to indicate the year of manufacture was also introduced. The position of Assay Master and the practice of applying the year of manufacture along with the hallmark have remained unchanged ever since. Although the modern Assay Office employs a range of modern technologies to analyse precious metals the practice of applying hallmarks as a form of consumer protection is virtually unchanged. 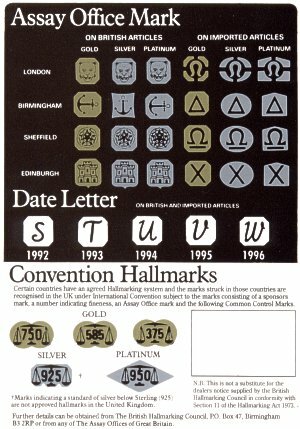 In more modern times the Hallmarking Act of 1973 confirmed the existing powers of the Assay Offices. All gold and silverwares which are not exempted by the 1973 Act must now be assayed and hallmarked by an approved UK Assay Office. Because the cost of raw materials known as precious metals is high, great care must be taken to ensure the quality of the material used to manufacture jewellery on sale to the public is good. Subsequently the role and objectives of the Assay Office and the responsibilities of the Assay master remain unchanged over 500 years on and are as important to the consumer today as they ever were.